A while ago, a friend of mine turned 25 and held a fairly big birthday party. One of the things he wanted to serve were jello shots: basically little shot glasses of jello with alcohol mixed in. The consistency and sweetness makes for a pretty interesting drink, and he wanted to make 70 or so shots, at least one for every guest. Ofcourse, to test it all out, he had to make a sample batch. While inspecting the sample batch, I noticed the jello had small bubbles of air captured in them, at various heights. The jello was solid enough to keep them there: they woudn't rise to the top of the shot glass at all. This gave me an idea: I ran upstairs and grabbed a syringe (I have a couple of them, they're pretty handy as flux dispensers etc) and put some green food dye in it. Now, by putting the needle at a certain position in the jello and releasing some of the dye, I could make 3d figures in the jello. I showed it to my friend, who thought this was pretty cool. 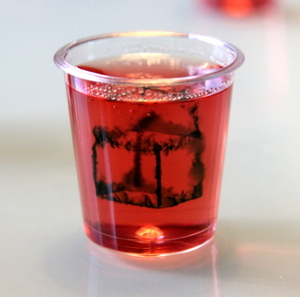 "But", he replied, "I don't think it's feasible to make figures by hand in all of the jello shots." Now you have to know, at that moment I was working on some pretty long-term projects and was itching for a little something I could finish within a few days. I saw an opportunity right there and then. "Never mind that", I replied, "I'll just whip up a 3d printer that can make nice figures in the jello for you."